Mekong tour, Mekong River Cruises, Mekong travel guide,Mekong boats,Mekong scenery. The Mekong River (known in Tibet as Dza-chu , China as Lancang Jiang and Thailand as Mae Nam Khong ), is a major river in southeastern Asia . It is the longest river in the region. From its source in China 's Qinghai Province near the border with Tibet , the Mekong flows generally southeast to the South China Sea , a distance of 4,200 km . The Mekong crosses Yunnan Province , China , and forms the border between Myanmar ( Burma ) and Laos and most of the border between Laos and Thailand . It then flows across Cambodia and southern Vietnam into a rich delta before emptying into the South China Sea . 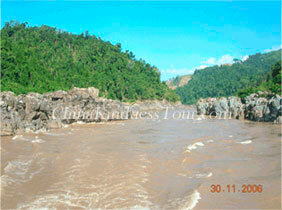 In the upper course are steep descents and swift rapids, but the river is navigable south of Louangphrabang in Laos . The Golden Triangle is one of Asia’s two main illicit opium-producing areas. It is an area of around 350,000 square kilometers that overlaps the mountains of four countries of Southeast Asia: Myanmar (Burma), Laos, Vietnam, and Thailand. 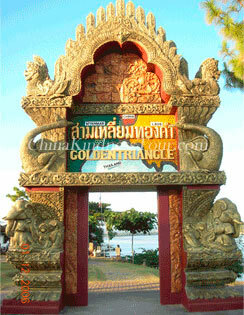 (Other interpretations of the Golden Triangle also include a section of Yunnan Province, China.) Along with Afghanistan in the Golden Crescent (together with Iran and Pakistan), it has been one of the most extensive opium-producing areas of Asia and of the world since the 1950s. The Golden Triangle also designates the confluence of the Sop Ruak River and the Mekong River, since the term has been appropriated by the Thai tourist industry to describe the nearby junction of Thailand, Laos, and Myanmar. Now Golden Triangle already becomes a famous tourist region for all the travelers from whole world because it’s mysterious history, attractive scenic spots, pleasant climate and colorful peoples.